Hubs worked super hard on this transition. The sidebar and a few other things need a bit of tweaking still. Poke around, check it out. Ok, I have the rest of the plans for you. First, We need to move the door in our Master. Believe it or not our king sized headboard doesn’t fit on any wall besides the window wall. So we’re moving the door and making it a double door. 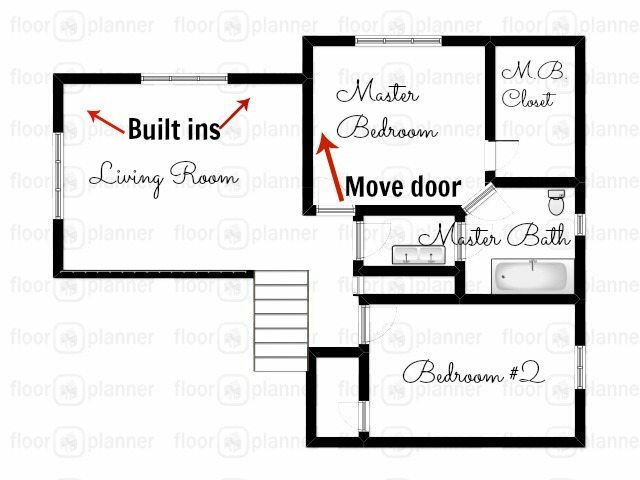 We’ll also have the doors open out into the living room rather than into the Master. It’s small! We don’t want to allow for more doors opening into the space. Next, the living room upstairs. We have gone back and forth on what to do in this room. I think we settled on a Library type space. We’ll build in bookcases and window seats. That’s as far as that plan has gone. Downstairs, there’s a little more work. That wood burning stove is in the way. And the stove and the step it sits on need to go. Fireplaces are not luxuries in Minnesota (at least for me) they are essential. I’ll give you a peek at the sectional we’re buying sometime next week!